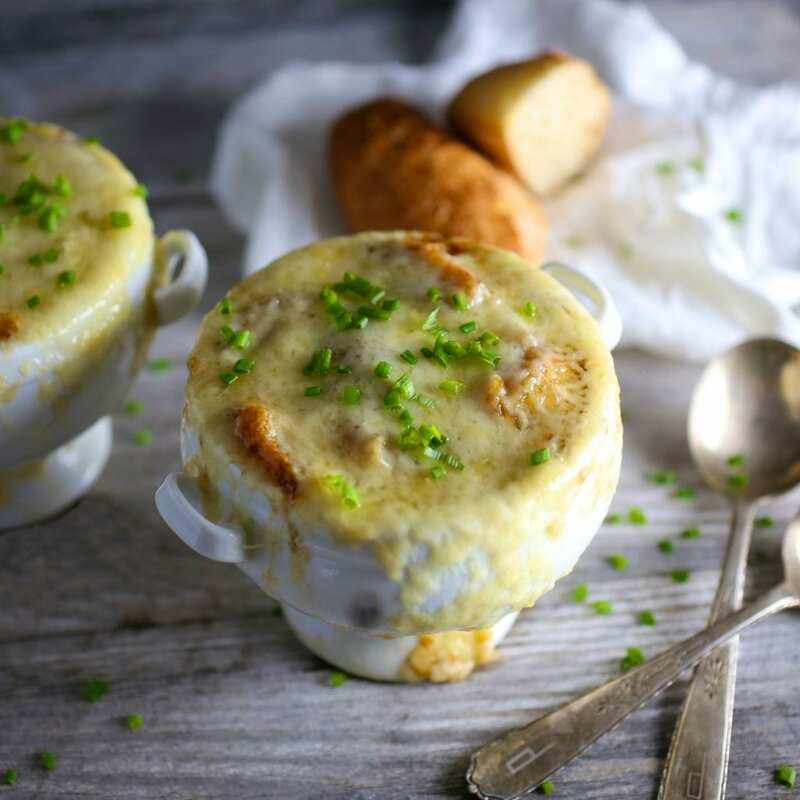 Unapologetically rich, boozy and indulgent, French Onion Soup asks nothing of you but time, but gives back a thousandfold in flavor, warmth and comfort. It may become your new winter BFF. Do you feel a disturbance in the force? As though millions of voices cried out in annoyance and were suddenly told to quit whining? That was the entire population of the east coast of the U.S. simultaneously accepting the fact that this winter will never, ever end. You’ve made your point Nature! Sheesh. No reason to be such a weiner about it. Matt and I on our way to the grocery store. 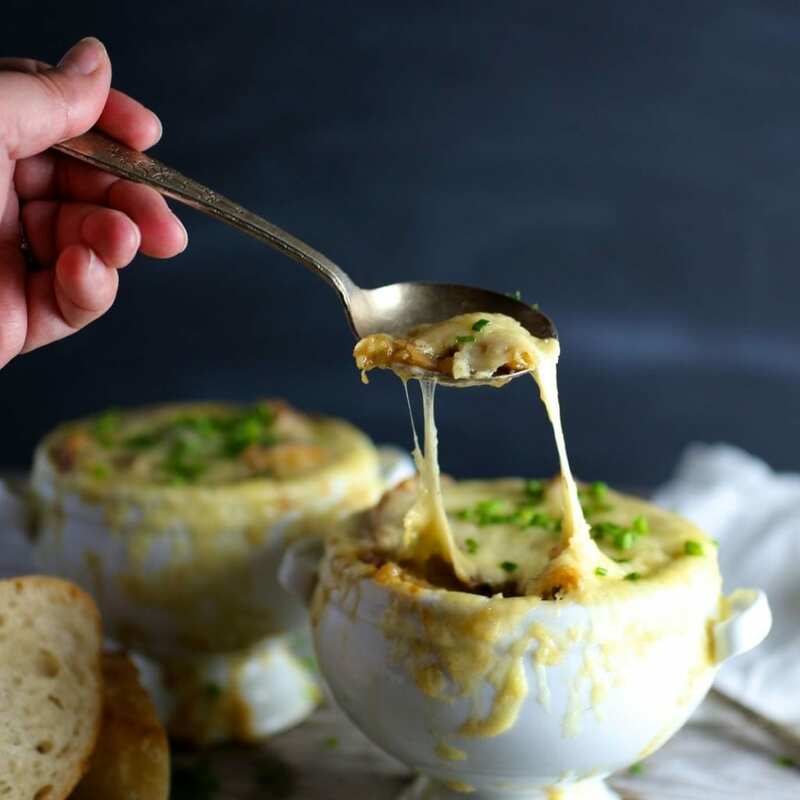 So, if you too happen to live in a frozen hell-scape (or just enjoy delicious French Onion Soup), this recipe is a great way to spend a frigid afternoon. Plus, it includes Winter’s top food groups. Bread, cheese and booze. Yes, there is lots and lots of alcohol in this soup. 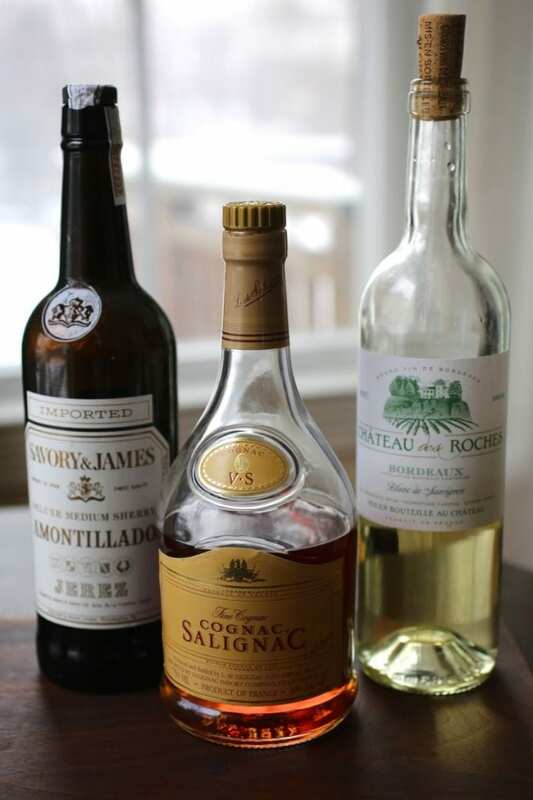 Three different kinds in fact, sherry, cognac and white wine. This might seem excessive (or if you’re like me, quite restrained), but the alcohol is entirely cooked out, leaving just a warm, rich decadence. Yum. A scandalous note about lying liars. 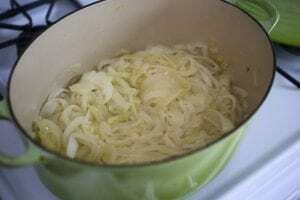 If you ever read a recipe that calls for caramelizing onions and it lists the time the process takes as 5, 10, even 20 minutes, you are being lied to. Yes, I said it. Lied. I think there is a lot of pressure to produce recipes that can be completed in under half an hour and that makes people fudge the truth about how long certain things actually take. As a non-professional home cook, I find this incredibly irritating. If I follow a recipe, I of course want it to be successful, but I want to honestly know how long it will take to prepare and cook. 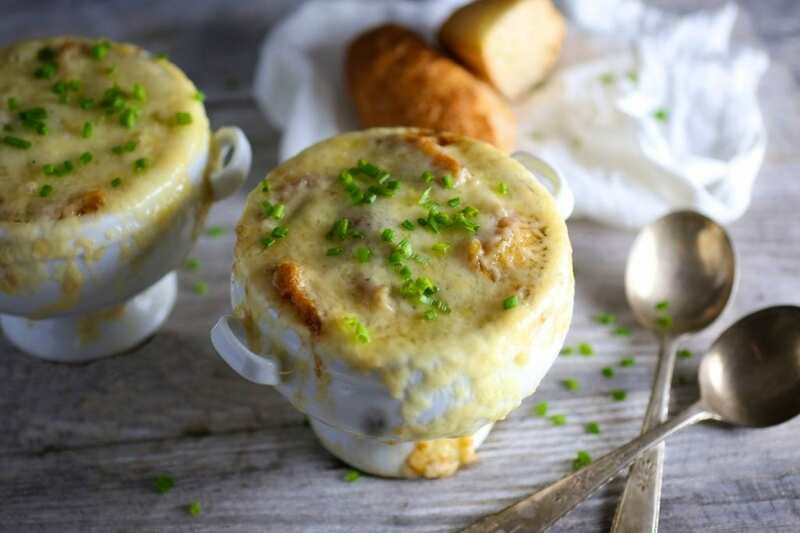 That way I can plan ahead and leave the long-cooking recipes – yes, like French Onion Soup – for when I have the luxury to enjoy the process of making them, instead of feeling stressed and annoyed that it’s now midnight on a Wednesday, and that “quick” recipe is still not ready. Just tell me the truth! I might act like a five-year-old but actually am an adult and can make time-management decisions accordingly. Okay rant over. Hey, at least that rage made me warmer. 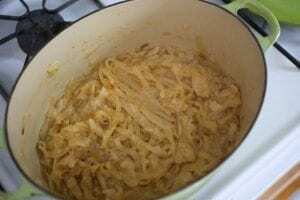 That was an incredibly long-winded way of letting you know that cooking the onions for French onion soup takes a long time. This is not a good recipe for when you get home from work at 9pm and just want something in your gullet as quickly as possible (though if you make it the day ahead, you could reheat it and make the cheesy croutons in 15 minutes). It took us a full hour and a half to get the onions to that perfect, meltingly sweet golden brown color. Now, you don’t have to stand over them stirring the entire time, but you do have to pay some attention to them. That being said, the result is glorious. Don’t cut the onions too thin or they will turn in to mush. This is what they look like starting out. 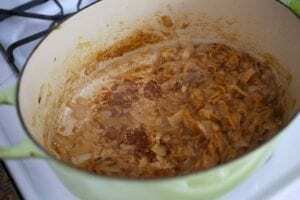 Onions after 20 minutes. Nowhere near browned. Onions after 45 minutes. Getting there. At about the hour mark, the bottom starts caramelizing so use a little water to deglaze. After 90 minutes. 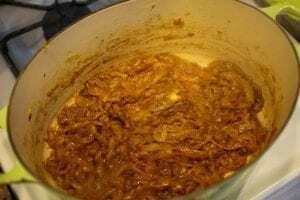 Perfectly caramelized onions. Use the best stock you can find. Beef and veal are traditional but good chicken stock is perfectly fine. In fact, I’m not a fan of canned beef stock so unless you can find a good one, go with chicken. We got our beef stock from Barb’s Butchery and it was delicious. Use any onions you like. Red ones turn a slightly dour gray when cooked for so long but you won’t be able to tell in the soup. I think sweet onions like Vidalias would get too sugary (for my taste) but some people like them. When making the garlic toasts, rub the bread lightly with the clove or it can be overpowering. If you don’t like garlic at all GET OFF MY SITE. Ha, ha, just kidding (sort of), you could easily skip it altogether. The fish sauce seems like an odd ingredient but it works really well. Use it sparingly though. Just a mere teaspoon is enough here. If you don’t have oven-safe soup bowls, prep the toasts with the butter and garlic, place them on a sheet pan and sprinkle cheese over them. Broil until cheese is melted and a bit browned on top. Place them into the soup and serve. For me, the key to this recipe is the buttery, garlic-rubbed toasts. The flavor is not overpowering at all but it’s just right. Like dipping crusty garlic bread into cheesy, oniony broth. Yes, please. In a large dutch oven or sauté pan, melt butter over medium-high heat until foaming. Add onions and ¼ teaspoon kosher salt. Cover and cook, stirring occasionally, until softened, about 8 minutes. 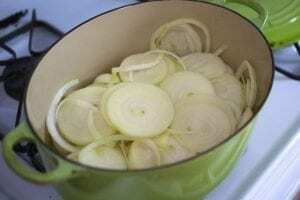 Remove the cover and lower heat to medium-low and cook, stirring frequently, until onions are very soft and a rich, golden brown color, 1 to 1½ hours. During this time, if the bottom of the pot develops a crust that threatens to burn, add 1 tablespoon of water, scrape up the browned bits, and continue cooking. You may need to do this several times, especially towards the end of the process. Raise heat to medium-high, add sherry and cognac and bring to a simmer, scraping up any browned bits. Cook until mostly reduced, about 5 minutes. Add wine and simmer for 15 minutes more. Add stock, thyme, and bay leaf and bring to a boil. Lower heat and simmer for 20 minutes. Add fish sauce, if using, and season with salt and pepper. Discard thyme stems and bay leaf. Preheat broiler and position oven rack to top position. Toast the baguette slices and while the bread is still warm, rub the surface of one side with the cut end of the garlic clove. Spread a thin layer of butter over the garlic toasts (if you want, you can cut each slice in half to make them easier to fit in the bowls). Spoon a small amount of soup into the bottoms of 4 oven-proof serving bowls, then top with half the toasts. Sprinkle some grated cheese on top of toasts, then spoon more soup on top, nearly filling the bowls. Set the remaining toasts in each bowl, pushing to nearly submerge them. Top with remaining grated cheese and set bowls on a rimmed baking sheet. Broil until cheese is melted and browned in spots. Garnish with chives and serve. So much to love in this post…GOT GIFs, caramelized onions, rants… I hate it when people put unrealistic cooking times on recipes! The “30 minute dinner” cards in Cook’s Country magazine are always dubious. I once made their portobello-leek crostata that had a stovetop cook time of 10 minutes & a bake time of 18 minutes. I guess you were supposed to de-gill, clean & chop 6 portobellos and 1 pound of leeks, roll out (pre-made) dough and assemble the whole damn thing in 2 minutes…OK, now my rant is done.